The top image, taken in August of 1981 in Babylon shows two Inter-County Canadian New Flyer D 901A's with just the edge of a GM New Look to the right of the frame. The second frame shows a GM 5300 New Look operating as fleet number 434 for Babylon Transit and signed for Walt Whitman Shopping Center. Picture three depicts fleet number 924 - a 1970's GM 4500 New Look operating for Coram Line Service. The last photo is the most interesting because it's an ex New York City Transit Authority 1958 GM TDH 5106 of the 9000 series now carrying the livery of Babylon Transit and renumbered 336. This bus is easy to spot because it was one of only 121 5106's built by GM with horizontal sliding passenger sashes and all went to New York City. Photos borrowed for educational purposes only. So Coram was using Coram Line Service on their Transit buses instead of Coram Bus Service. I wonder where that bus in the picture came from, i'm sure it was a hand me down as all the buses that i tracked that they brought where numbered in the 1xx's. First time i've seen a pic of a Coram Lines Bus, Don't think it was my Grandfather behind the wheel. I wonder if the S20 did run to Halesite or if someone was just being funny and some how switched the route sign and destantion sign. The closest route i know with a 2 in it that went near Halesite is a route numbered S21 that went from Sunrise Mall to Walt Whitman Mall. 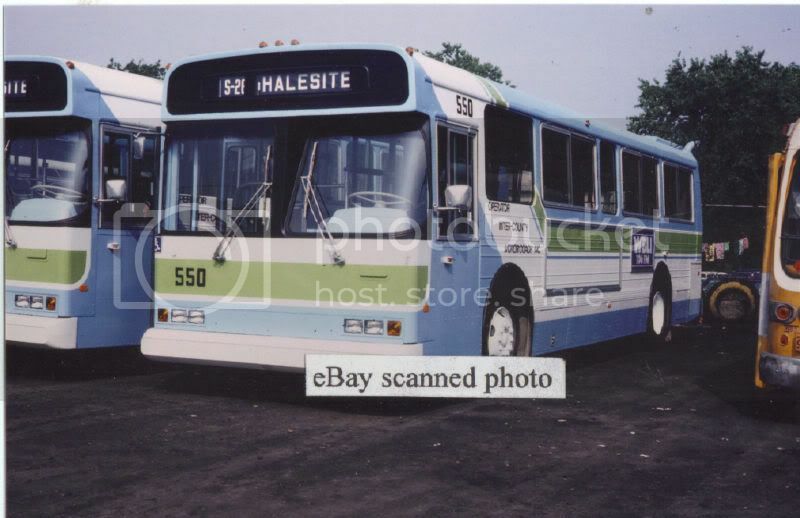 This is the first time i've seen a picture of 550, the only New Flyer pic's i saw until today was of 552 and 553 on the S54. 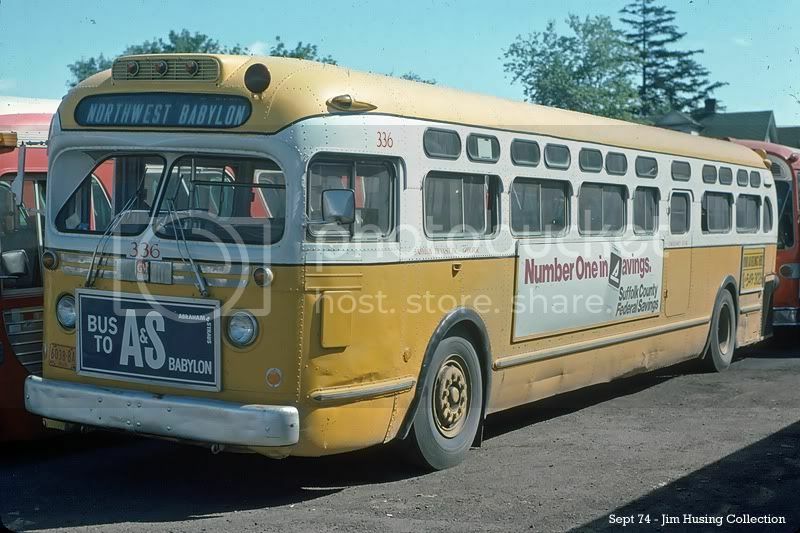 Funny thing, Inter County had a bus numbered 336, though i don't think its the same bus, that had ties with NYBS. I forget what way i wrote the bus went. It was either sent to NYBS or brought frm them. Thanks for finding those pics and posting them mr.Linsky, i know i've tried countless times in the past and never was able to find anything, but i suspect i wasn't looking in the right places. Here's one that I missed altogether; fleet number 507 - a 1960's TD or TGH 3501 operating for the Suffolk Bus Company and signed for #2 to Babylon. Must have been bought used because I find nothing under new purchases for it. These dual headlight jobs signaled the last of the GM Old Look design which had a run of twenty-eight years! I did find something on that bus. It is a 1966 GM TDH 3501, it was in an order of four numbered 505-508 and serial numbers #0625-0628. However, to add more confusion to this comment, there is a picture in the 1996 calendar showing fleet #340 taken on April 14, 1979. The bus is still in the GRTA livery, yet the ID says Coram Bus Service, Inc. Does this mean that there were 2 entities, for some legal purpose? destinations? The two units look like they just came back from a paint shop and possibly reasigned to a different operator. Look again at the pictureand you'll see a piece of a Babylon Transit fishbowl. Kudos to my dear friend,WCA, for posting these gems. Coram Line Service was founded in 1980, i looked it up after i made the post, so i figure some time after 1980. That would explain why #340 had Coram Bus Service on it in 1979. Though Coram Line Service was most likelt created after the New Flyers arrived as they are listed as being assigned to Coram Bus Service, though Coram could have entered into a contract with the county before they decided to spin off their Transit operations. I don't know about a legal purpouse, though if they could hardly fund one company, it must have been very hard to fund two companies. 550 was assigned to Inter County stight out from what i can tell. But you could be right and all the buses could have been ordered with all the destanation signs. 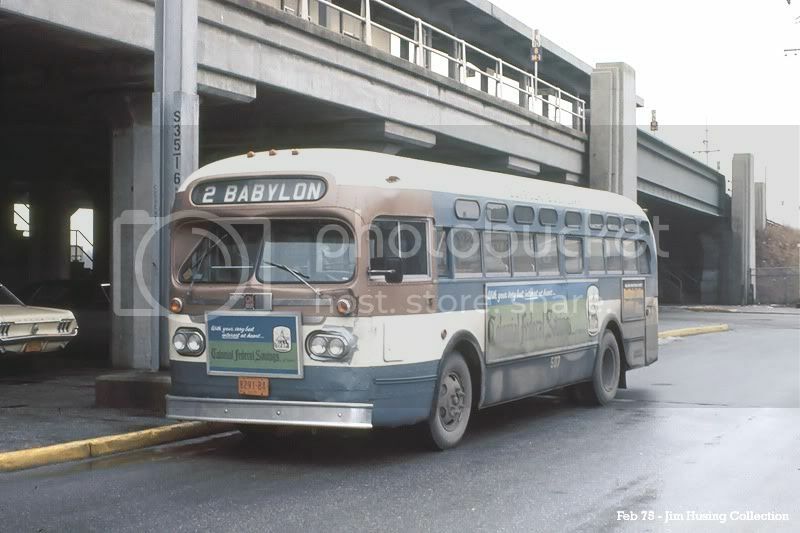 Or The S1 could have been run by Babylon Transit (I have no idea when EBT started running Transit), and Inter County and Babylon had a relationship or shared buses and that could explain why Halseite was in the destination sign. I believe that EBT was awarded the S-1 from the day Suffolk County took control of all routes. Then i wonder why EBT didn't recive any New Flyers, unless you are right and 550 and what ever the number of the one next to it, wasn't assigned to Inter County when it arrived. Meaning Inter County only had 552 and 553 when the New Flyers arrived. I haven't tracked any Transit buses going to EBT before the 1982 Gillig Phantoms, though i did find a few buses that were brought by a father and son company that had the same address as EBT's yard. I wonder if they are the same company? If my memory is correct,the S-1 was always covered by Gilligs. Don't ever recall a New Flyer on the route. Here is my partial Vintage Roster for Suffolk Transit, before and after it was created. I went up to the 93xx's because i felt they are kinda vintage at this point. Very comprehensive rosters for Suffolk - good work! 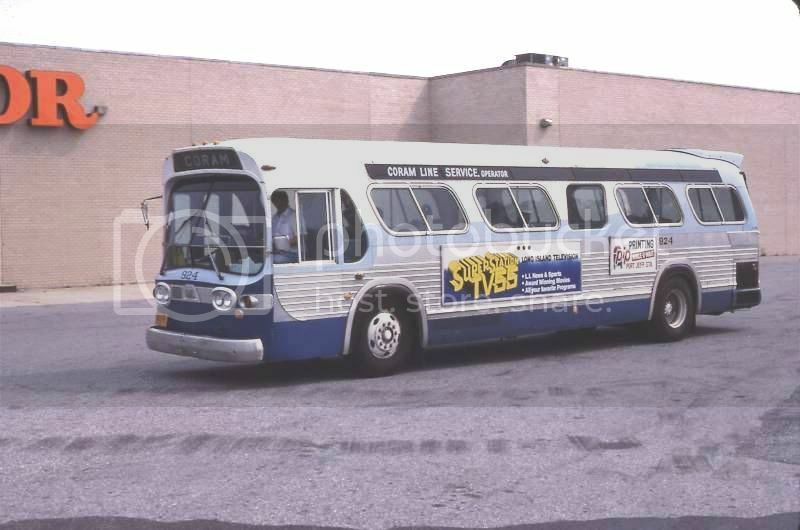 My only comment would be that Babylon Transit # 336 (pictured again below) is a TDH 5106 and not a 5105 (it was one of 121 delivered originally to the New York City Transit Authority and carried a fleet number in the 9000's). Also note that it had a painted steel bumper when new and no ICC markers on the ThermoMatic intake over the destination sign. Regards and best wishes for the coming year. Sorry about that, i must have hit five instead of six, i'll fix it. When I get a chance, I will look through the 3 Mega Bus Calendars I have to see if you've overlooked any buses. One omission that will take some time to research is that of HUNTINGTON COACH that ran the north half of the S-1 from Halesite to WW Mall. From memory I know Fishbowls 404 & 405 were the last workhorses on that line. Joe S has a picture of a suburban Fishbowl, with LIRR signage that was in their fleet. Perhaps my good friend from the other coast, Mr. Linsky can fill it in before me. 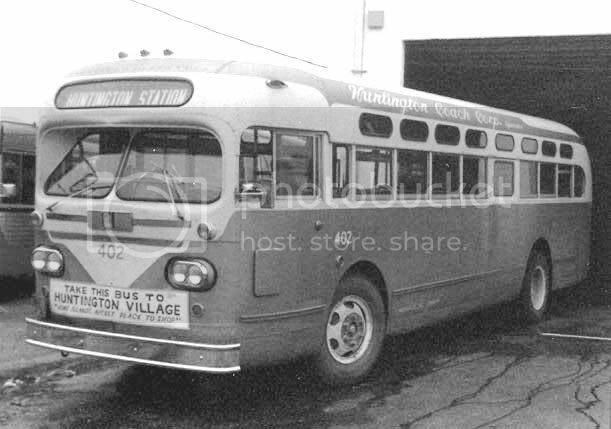 I know on the website of Huntington Coach, under the history it shows a picture of a transit bus. I really can't do a lot to help (although I thank HartBus for his vote of confidence) except to post a couple of interesting and historic Huntington Coach Company photos taken from their website. The upper image of the company's Bayville Yard in 1949 shows three prewar Macks with the two on the left of the frame being lightweight models - probably in the LD or CW class. The bus in the upper right looks to be possibly a heavier CO model and the wreck by the garage door is anyone's guess. I have searched Mack production records and find nothing purchased new by Huntington Coach. 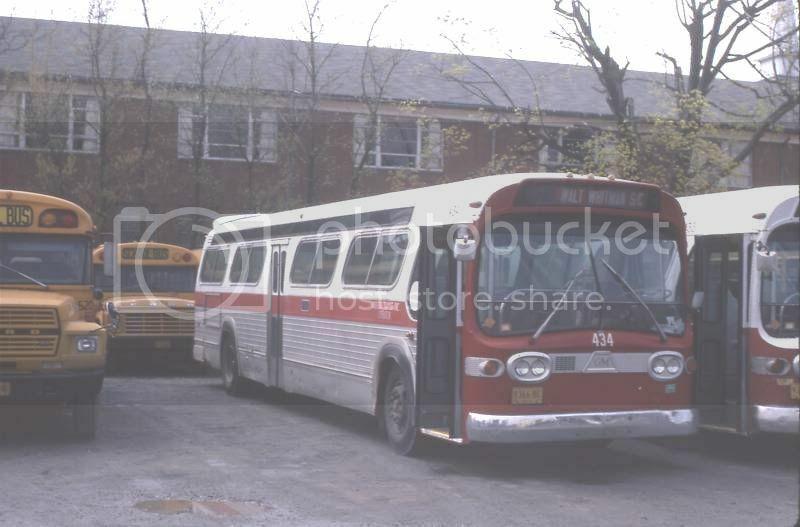 The lower photo shows fleet number 402 - a 1965 GM Model TDH 3501 and one of three (401 to 403) delivered to Mannville, Inc. DBA Huntington Coach Corporation of Bayville, New York in November of that year. These 3501's were equipped with ToroFlow Truck Diesels and hydraulic transmissions. 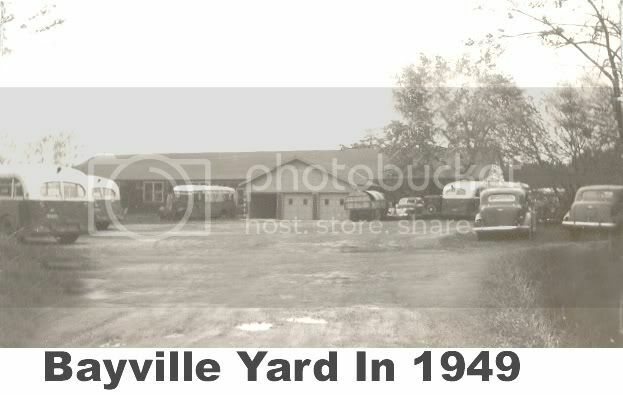 BTW; the Bayville Yard image is a great slice of the past.